In a city of striking architecture and towering structures, the Flatiron Building is one of New York’s most celebrated skyscrapers. Its elegant design and narrow wedge shape (which seems to defy the laws of physics) has intrigued New Yorkers for over a century. The Flatiron has been the subject of paintings, photos, postcards and films, making it a quintessential symbol of New York. In the late 19th century, the area around Madison Square was home to an elite neighborhood, the fashionable shopping district called Ladies’ Mile, and the city’s bustling entertainment center. This made the narrow triangular block at the intersection of Broadway, Fifth Avenue and 23rd Street the most valuable lot in the city. 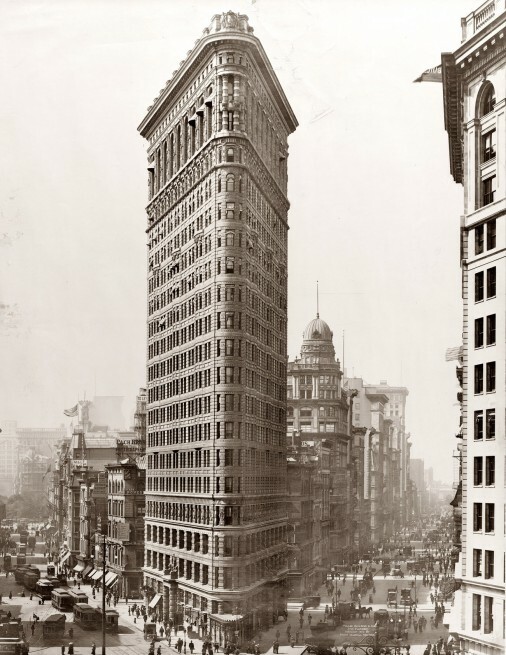 Yet the coveted sliver, known as “the flatiron” for its shape like a clothes iron, presented a challenge to developers. In 1899 Harry S. Black purchased the plot to build a headquarters for his prosperous contracting firm. To design his new building, the first skyscraper north of Union Square, he enlisted architect Daniel Burnham. Burnham was renowned for his innovative skyscrapers in Chicago, his designs for the World Columbian Exposition (aka Chicago World’s Fair) and Washington D.C.’s National Mall. For this irregular plot, Burnham devised a vertical Renaissance palazzo with Beaux-Arts styling. Unlike New York’s earlier skyscrapers, it employed a revolutionary steel skeleton, which was incredibly strong and allowed for thin, graceful walls. The design was so ahead of its time incredulous New Yorkers speculated on how quickly the wind would topple the building. The 22-story tower rose 285 feet, yet is only 6.5 feet wide at its northern point. The Flatiron soon attracted the attention of artists. It is the subject of now-classic photos by Edward Steichen and Alfred Stieglitz, as well as paintings by artists including John Sloan and Childe Hassam. 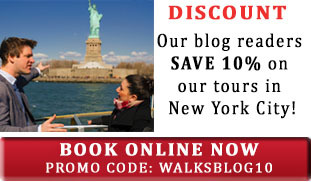 Almost immediately, the fascinating building was featured on postcards, which made it a familiar icon of New York City. The Flatiron Building was designated a NYC landmark in 1966 and a National Historic Landmark in 1989. The trendy area surrounding the building is now called the Flatiron District. In 2009 the Sorgente Group, an Italian real estate investment firm, bought a majority stake in the Flatiron Building. They will convert the building into a luxury hotel in 2019, after tenant leases expire. 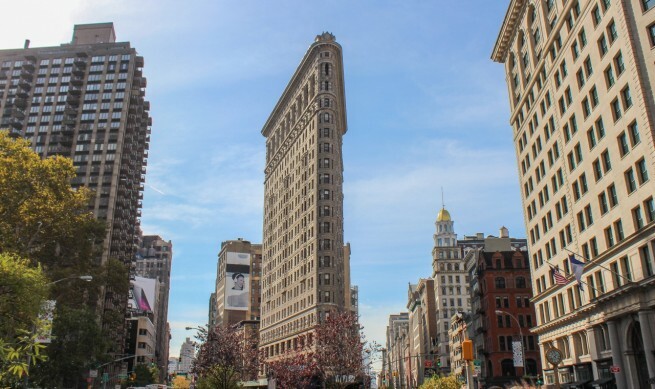 The Flatiron Building is located at the intersection of Broadway and Fifth Avenue, between 22nd & 23rd Street. Subway: N & R to 23rd Street. One block west is the F,M & PATH train 23rd Street stops, and the 6 train is at 23rd & Park Ave. South (2 blocks east). 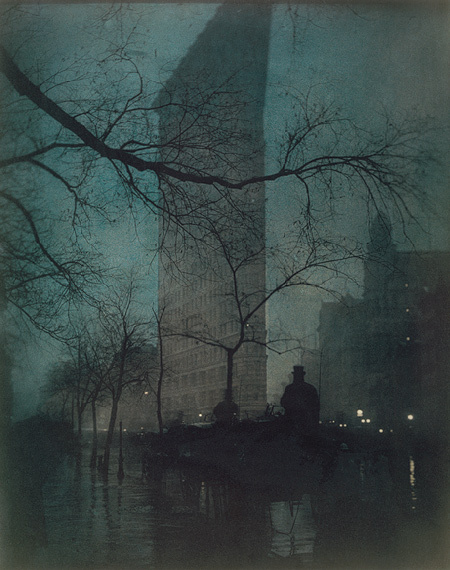 Edward Steichen’s classic and evocative 1904 photo. Wikimedia. The Flatiron Building is an office tower with no public access. Still, from its exterior one can marvel at the building’s improbable dimensions and exquisite details. The Flatiron is designed like a classical Greek column, with a limestone base, central shaft and elaborate capital. 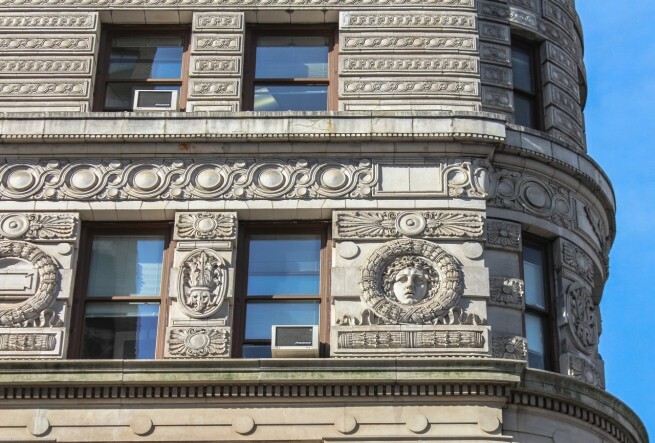 The glazed terra cotta ornaments include flowers, wreathes and Medusa heads. Wonderful views of the Flatiron Building can be seen from the central pedestrian islands between 23rd and 25th streets and from inside Madison Square Park. Three spots of note: 1. beside the Tiffany street clock in front of 200 Broadway, 2. the corner of 23rd & Fifth Avenue for great views of its narrow wedge, 3. the pedestrian island east of the building (Broadway between 22nd & 23rd Streets) for views of the intricate terrace cotta decoration. Note: The best vantage point for photos of the entire building is facing south toward its point. However, by midday the sun will be shining from behind the building until sunset. Accordingly, the best time to photograph the Flatiron Building is early mornings. Before the current building, the flatiron plot was home to a seven-story hotel and low-rise commercial buildings at its northern point (technology did not exist to build tall on the narrow space). The previous owner stretched a canvas on the northern wall of the hotel, upon which he projected images from a magic lantern. This was NYC’s first electric advertising – a precursor to the spectaculars of Times Square. When the Flatiron Building opened, it did not include restrooms for ladies. Restrooms for men and women are now located on alternating floors. 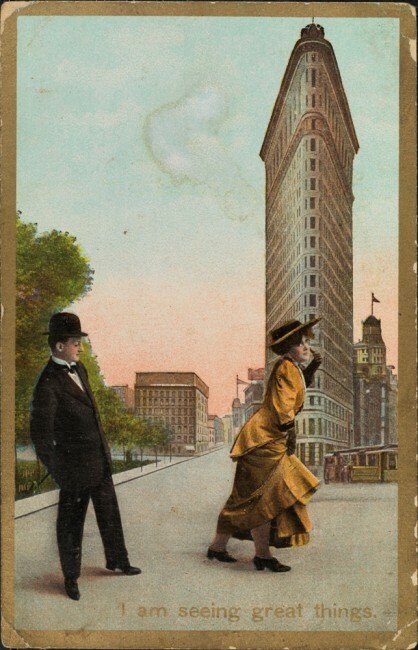 This vintage postcard shows one of the Flatiron’s early attractions. The Flatiron’s tenants are primarily publishing companies. However, the building has hosted some unusual occupants, including toy companies, the Imperial Russian Consulate, songwriters from nearby Tin Pan Alley and the notorious crime syndicate Murder, Inc. The Flatiron Building is frequently featured in television shows set in NYC and TV commercials. It’s often a location in films, including Bell, Book and Candle and the 1998 Godzilla in which it was accidentally destroyed by the U.S. Army. It is perhaps best known to moviegoers as the headquarters of the Daily Bugle in the Spider-Man movies. 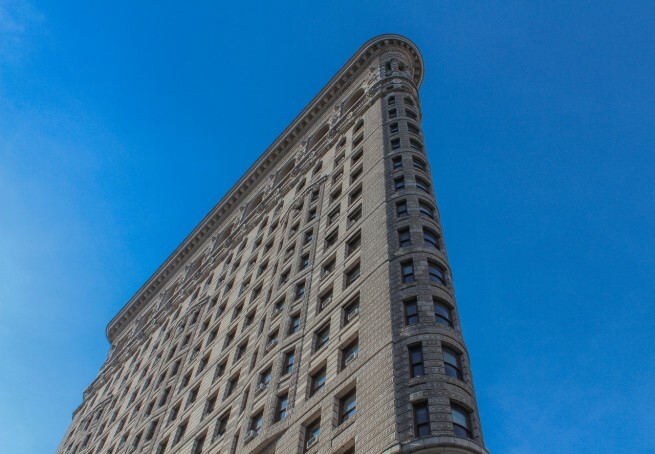 Have you visited the Flatiron Building? Tell us what you thought.